Based on our movement work, we know that vultures from the Mara spend about five percent of their time in the two Tsavo National Parks. For this reason, I decided that it might be worth exploring the area one more time to get a feel for this unique ecosystem during the dry season as well. If the Mara is the land of plenty, then Tsavo is the world of giants. Huge red-dusted elephants walk silently upon the dry earth and dig incredible holes in their constant search for water. Beautiful baobabs are scattered around, their fuzzy fruits littering the ground as their impressive trunks and finger-like branches cover the landscape. 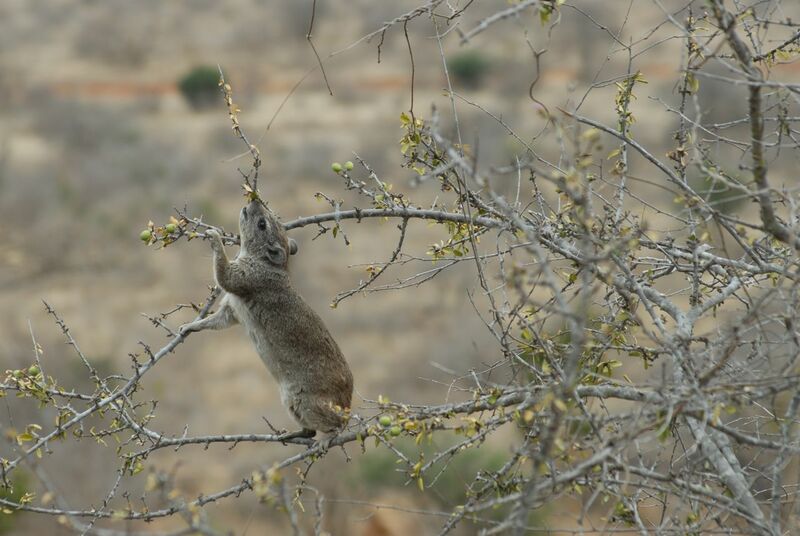 Hyraxes can be seen in the many rocky outcroppings and we were lucky to find one climbing a small branch reaching hopefully for some tiny green berries. 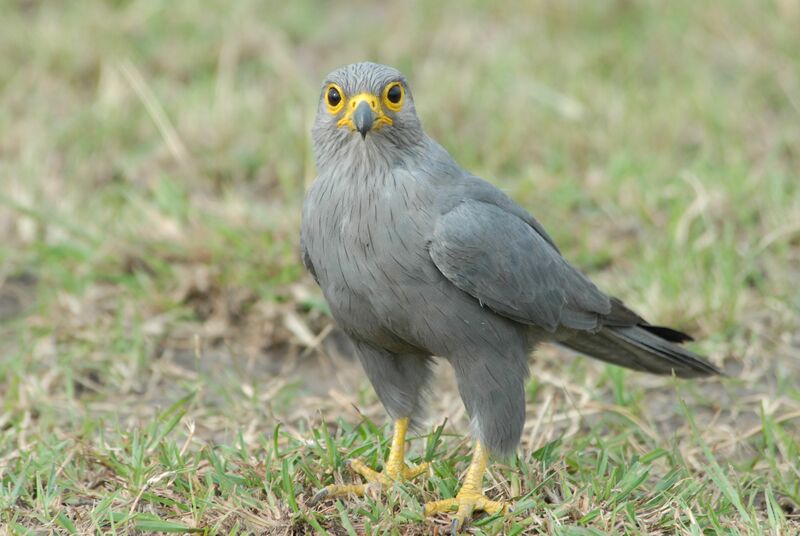 Pale chanting goshawks were the bird of plenty here though we saw only a handful of vultures. It isn’t often that you get to watch a carcass from start to finish, but I got lucky. We came upon a single lioness finishing off a fresh wildebeest kill. On her own, she was only able to consume perhaps a quarter of the carcass and with vultures, hyenas, and jackals gathering around the lion was beginning to feel the pressure. So she left. Two hyenas moved in first feeding for a half hour they ate the bulk of the carcass with the occasional jackal or vulture rushing in to steal a soft piece of organs. Then it was the jackal’s turn. The pair rushed the vultures viciously, leaping and snarling to keep them away. The little dogs fed greedily, but their small stomaches were soon rounded and they slowly moved away. Down to the last half, the vultures swarmed, forming perhaps the most perfect pile I am yet to have seen. The wriggling brown mass of wings bounced above its prey as all fifty heads vanished into the food. Occassionally a full bird would eject itself from the mass standing on top of its comrades to gain enough leverage to leap away. Even with the mammals gone, the feeding frenzy of White-backed vultures was soon interrupted by their larger brethren, the Lappet-faced vultures. A pair jumped onto the mass, biting down on the backs of the birds beneath it. Once removed, the damage to the carcass was clear, perhaps only ten percent remained. 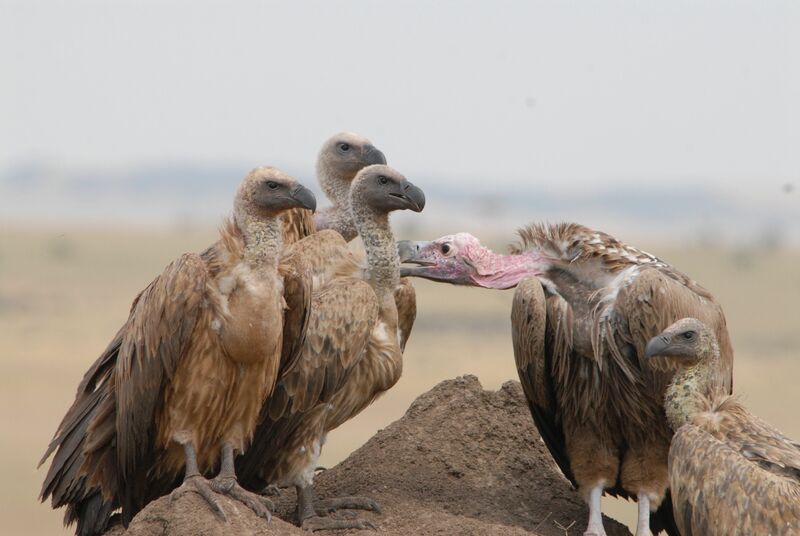 The Lappet-faced vultures fed slowly and laboriously, ripping and tearing the last few tough pieces of tissue, while Hooded vultures wandered the edges of the carcass finding small treasures in the intestinal remnants. A pair of Tawny eagles made a brief appearance, but could do little more than steal a small piece of organs to fly away with as the vultures so clearly dominated the scene. Carcasses can be found almost everywhere. Over the course of the migration, thousands will be found in the river. Lions and hyenas often enjoy dragging their kills into the darkest recesses of the bush but more often then not, carcasses are lying out in the open plains just waiting for the vultures to find them. On rare occasions, dead animals can get dragged into trees. In my first year, I had the pleasure of watching two White-headed vultures feed on a treed Thompson gazelle carcass before being pushed off by some tourists who seemed more interested in the carcass than the birds. Today we came across a treed wildbeest, the head dangling from a branch with much of the body consumed. 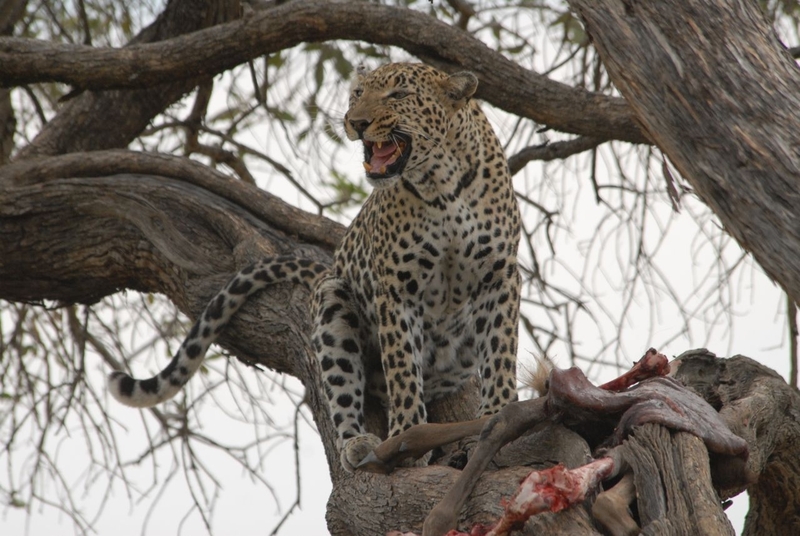 Sitting behind it was the cause – a large female leopard fast asleep after her efforts lay stretched limbs hanging below the branches and head resting on her paw. She was completely at peace – content with today’s efforts and meal. We sat with her for a while and eventually she decided to get up. Her eyes opened first and were slowly followed by her sitting up, looking rather unsure that she was really ready to leave. She hissed a few times while moving the carcass around, trying to decide it was worth leaving. When she finally leapt down, it was to grab one last piece (part of the spine), which she wandered off with, back into the bush. The carcass was well hidden beneath the branches and although vultures flew overhead I was pretty sure none would land here. Vultures aren’t generally known for their affection, but on rare occasions you do see acts of kindness. 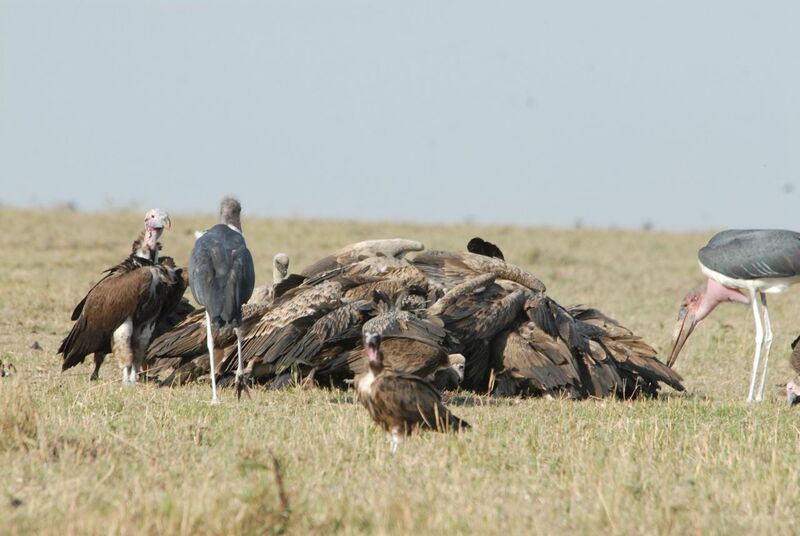 Merely the fact that vultures spend so much time at the carcass long after they are full is perhaps a sign of how much they enjoy each other’s company. Allopreening, when one animal cleans another, is surprisingly common and I have seen it between members of the same species for all five species present in the Mara. Lappet-faced vulture pairs will lovingly comb through the feathers of their mate and juvenile White-backed vultures will preen each other as they stand on a mound near a carcass waiting their turn to feed. Today was the first time I had seen “preening” between species. A full juvenile Lappet-faced vulture stood next some other successful birds of the White-backed variety. She tilted her head and eyed them carefully as if this was perhaps her first close glance at one. She inspected the neighboring bird with interest. Then she reached towards it, gently, not in the typical aggressive style of feeding birds, but simply so that she might touch the other bird with her beak. The White-back stood by calmly, closing its eyes during the tender embrace. But then the inspection got a bit too personal. Perhaps enticed by the red (carcass-like) patches on the White-backs shoulders, the young Lappet went in for a nibble, testing to see if these “pieces of meat” might come off. In offense, the White-backed scooted back just out of reach of the next love bite. Carnivores have it easier in the Mara, especially this time of year when the park is filled with wildebeest. As I drive around searching for carcasses, the number of lion, leopard, and cheetah kills has been staggering (though the number of vultures at these carcasses is usually minimal). Thus it shouldn’t be too surprising that some carnivore moms are atypically successful. For no animal could this be more true than the cheetah I saw today. 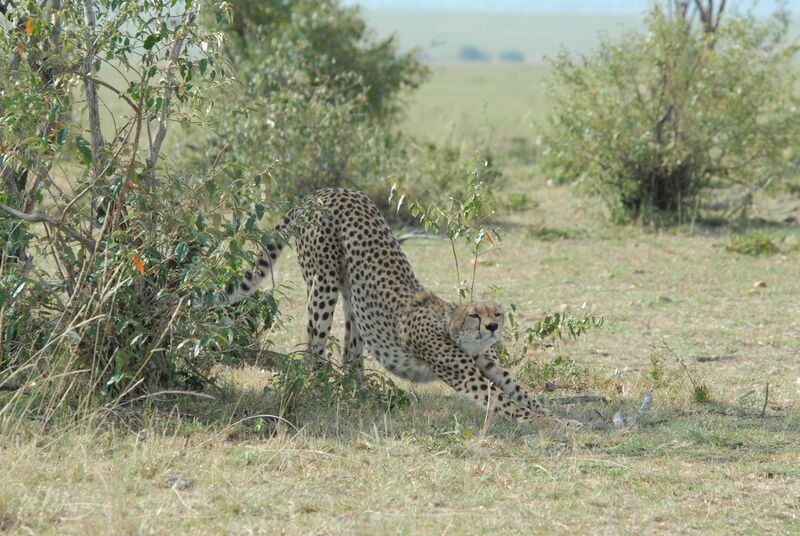 We drove up to see just one cheetah sitting in the short grass under the shade of a small Orange Leaf Blossom bush. She didn’t have a kill and I was just about to head out when I realized there were many more spots in the bushes. 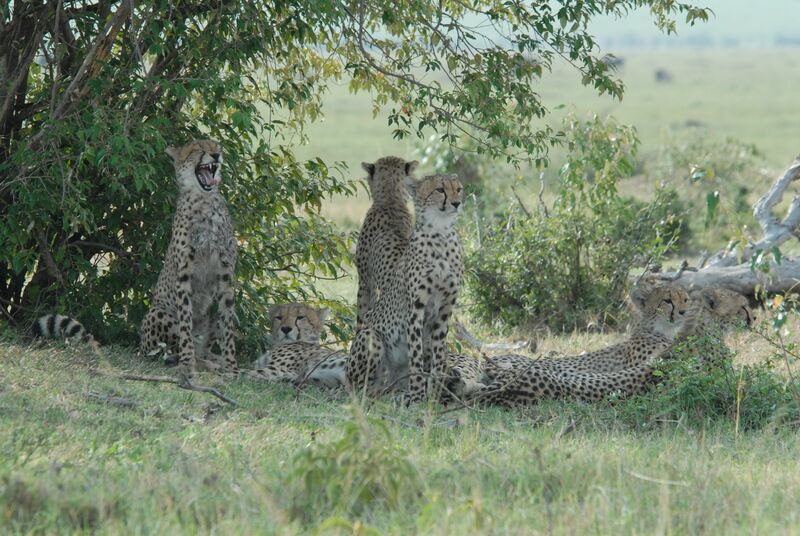 In the fact, the spots of not one but seven cheetahs were clearly visible. Although cheetahs can often have large litters it is unusual for more than two or three of the cubs to survive. Yet lying in a heap of freckles were six healthy nearly full grown cheetah cubs. Super Mom had made it happen. Having had a short rest, Super Mom was back to business and got up with a large stretch and a yawn before ducking low to get a closer look at some nearby Thomson gazelles. The cubs took interest too getting up one by one to see if it was time to hunt. Mom had decided they better wait and returned to a bush near the cubs for another much deserved nap. The focus in the Mara is generally on the carnivores (and in my case the vultures), but there are so many other fascinating little creatures to behold in this amazing savannah. 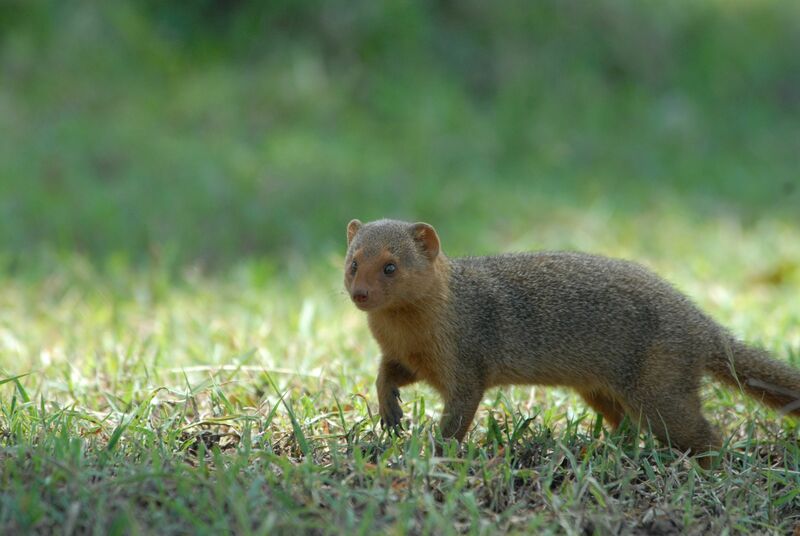 Banded and dwarf mongoose are common and I often stop to watch the antics of these social little creatures. Most recently I even saw a small group of banded mongoose at the crossing, darting among the vultures and Marabou storks in search of some wildebeest meat. Then while over in Musiara marsh I had some great views of this dwarf mongoose. The tiny creature wandered around in search of its small insect prey only to find a nice hollow tree to scavenge through. Yesterday I spotted this grey kestrel right along the road. It was waiting patiently along a termite mound as flighted new queens erupted from the ground, preparing to search for a new place to start a colony as the smell of rain blessed the air. The kestrel got a few termites before being chased off by a rather aggressive White-bellied bustard who wanted to claim the mound for his own use. At lunch I had an exciting run-in with another small creature. As I took my seat on the ground looking across the plains for my picnic lunch, my guide scared an Agama lizard that had been hiding a few feet away. Startled, the lizard booked it towards the nearest tree, which happened to me in my general direction. I barely caught sight of it as it raced into me and then up into the safety of the tree. 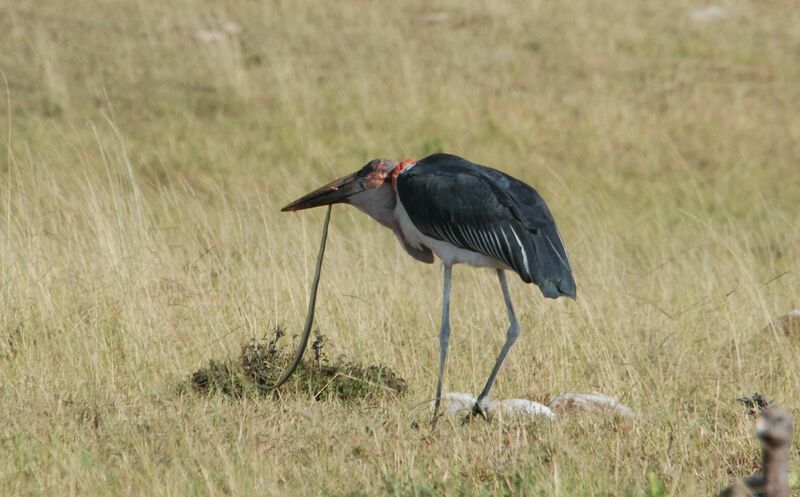 As I watched the squabbling vultures at a nearly finished wildebeest carcass, I noticed a Marabou stork behaving strangely. It jerked from side to side and leaned close to the ground as if about to pick something up, only to jump back again wings spread. I focused my binoculars on the bird to get a pick at what was happening. Lying in front of the cunning Marabou lay a long slim green snake, head raised in attack as the bird reached for it again. The snake lunged but the Marabou still got in a nice bite to the back and easily avoided the fangs. Again and again the snake lunged and the Marabou ducked until finally the Marabou grabbed the snake by the head. By this time another stork and an inquisitive African white-backed vulture had come to see what their friend might have. Given that sharing such a meal was unlikely, the disappointed birds walked way, shrugging their shoulders (as vultures always do) as they raced back to the carcass. Snake in beak the Marabou shook its prey and the snake writhed, coiling its mass with little way of escaping. Within minutes the battle was over but the war was not yet one. The Marabou now held in its mouth a three foot snake that hung limply, but how to swallow such a beast would be a bit of a challenge. The first attempt the Mara bou managed to get the snake about two feet down its throat before spitting it up again to try a new position. The second attempt went much smoother and like a magician pulling a long colorful line of scarves from his sleeve, the snake disappeared into the gullet of the stork.